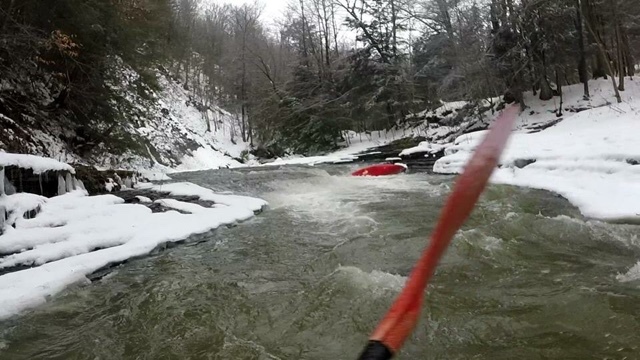 A DANGEROUS WINTER DAY ~ On The “Glug" with Zoar Valley Paddling Club.by Jason Carpenter | DBP MAGAZINE ONLINE The World's Best Free Whitewater Publication. It would be a lie if I told you the day started out like any other day before a paddling trip. It was January 16th; an island of warmth in a week of bitter cold temperatures. First of all I made myself a pretty decent breakfast, something I never do before having to squeeze into my 5mm wetsuit in the winter. And while loading my gear into my ride’s truck we discovered they had lost their canoe paddles at some point in time. And though I had planned and packed to paddle one creek, I learned on the road that we would be heading to the little town of Westfield NY, a quiet little town that I called home for a short time. Westfield is home to concord grapes, Welch’s grape juice, Mogen David wines, better known as MD 20/20, and a 14 mile stretch of gorge known as Chautauqua Creek. Or the “Glug” by some. This was quickly shaping up to be the adventure we had all asked for. 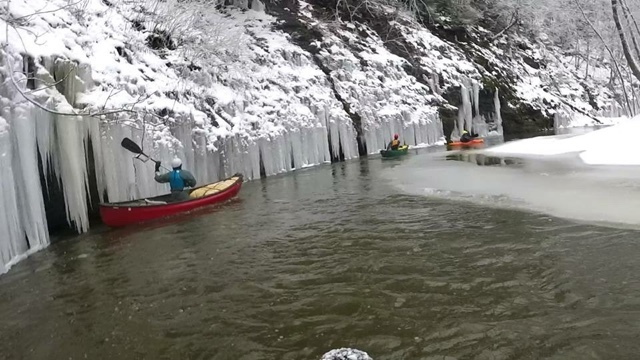 For if the rumors were true, we’d be the first paddlers in 10 plus years to make this decent. And as such a moment would call for, I was equipped with my GoPro but I had no memory card. So a quick stop to a store was needed. Upon opening my package to retrieve the SD card from steel like grips of the plastic, the card snapped into two pieces. In hindsight, these were probably signs to reconsider what we were about to get into. As we pulled off onto the Westfield exit, my heart briefly started to pound. 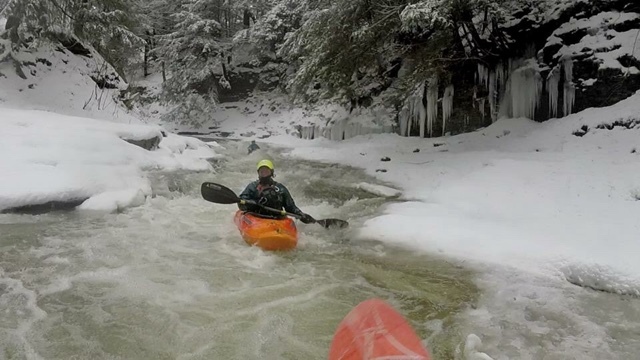 Not only because was I excited to run this creek, but it was a creek I often thought about in the 2 years that I’ve been paddling whitewater. Not only did I call Westfield home for a little over a year, but I spent many a summer nights partying, being loud, and…let’s just call it sleeping in that creek under the stars. 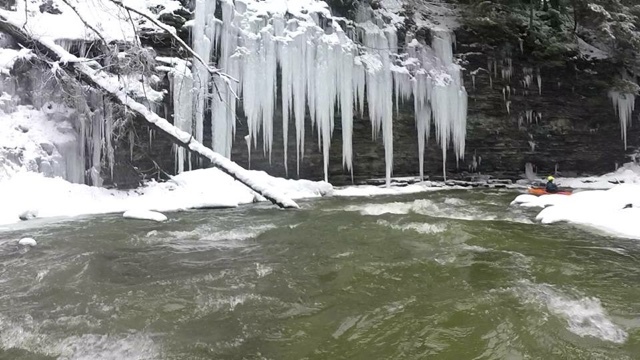 And for a moment, I was caught up thinking about the greater meaning and connection between me living there at 18 and my coming back to paddle at 36. As we drove through town I was overcome by familiar places that looked quite a bit different too. We drove over the Rt 20 bridge, then down a side road and under the bridge to the take out. 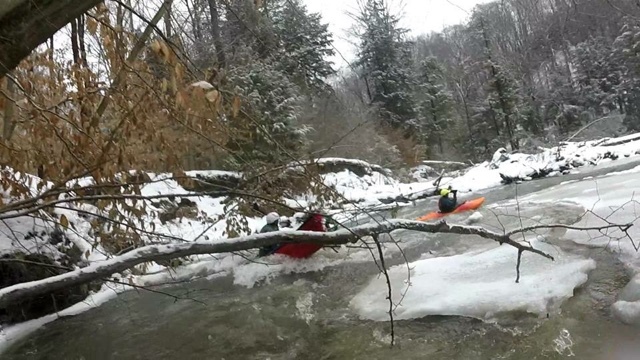 And there, in a snowbank like a shining beacon saying ‘all will be well’, were the lost canoe paddles belonging to Anthony & Laura (they’d paddled a feeder creek to the Chautauqua a week earlier and left their paddles behind). And for awhile all was good. At the put in we were treated to the beautiful scenery of the gorge, maybe 15 to 20 feet at its widest. 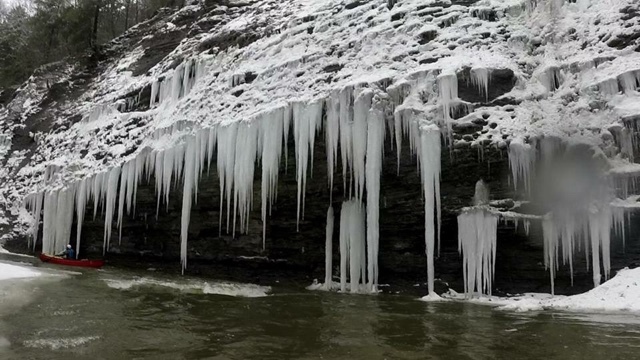 A coating of snow accented the trees and ground, while whole cliffs were encased in an armor of ice with 20 foot icicles hanging about. The creek itself started out with class 2 boogie water. 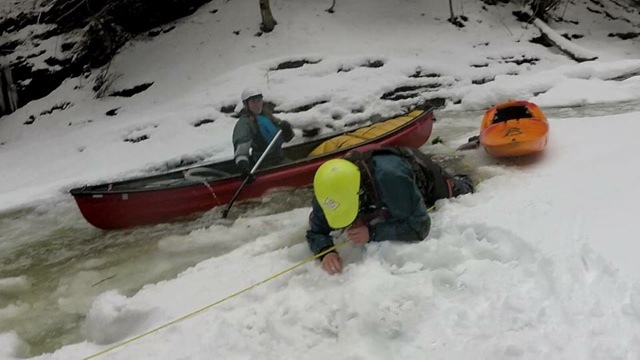 Caught up in the moment of a new creek and staring at the landscape, I came into the first small drop not really paying attention, only to find the first of two ice dams. 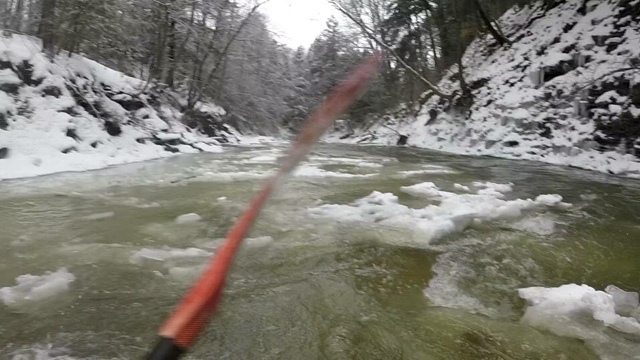 Not sure what to do, as this was my first encounter with one, I simply lucked out and found a channel of water that cut through the ice. 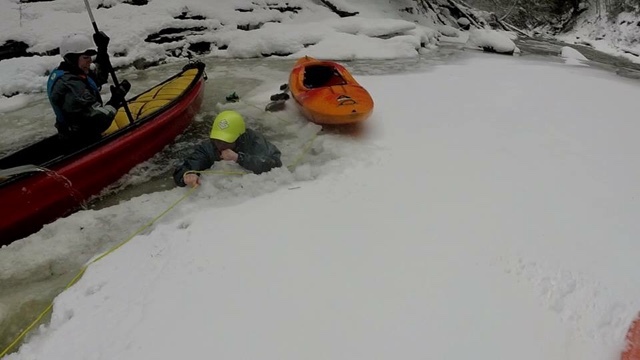 At this point the creek artificially narrowed from ice to channels only 4 or 5 feet wide. Maybe less. I led the group to the second major rapid. A blind drop that was hidden behind a sharp right turn in the creek, made up of what I think are three separate little drops, this chute, though it almost ate me, was one of the highlights. Except for the major ice dam below it. In an instant the trip changed. There was nowhere to eddy out. Nowhere to stop. And the boats kept piling up. 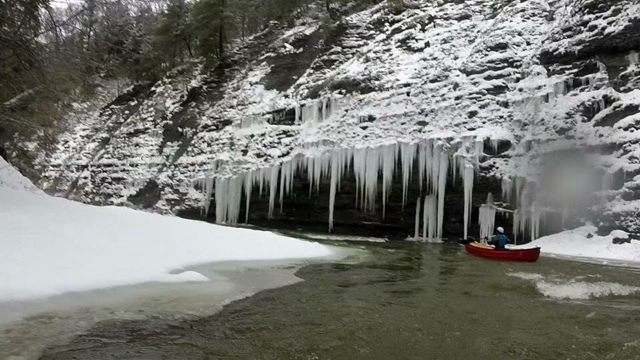 Two kayaks and two canoes stuck on an ice dam. We were now looking at a life or death situation. In the chaos one boater, Mar, came out of her boat and became trapped. 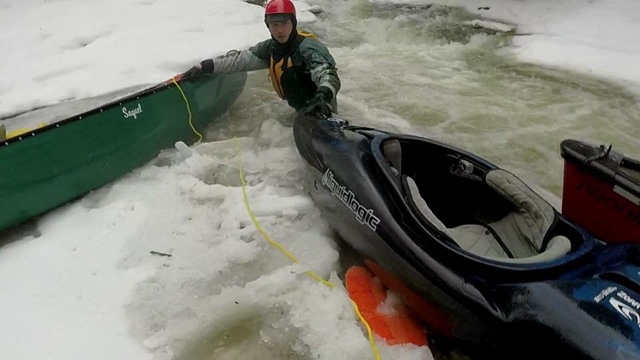 Clinging to the ice, desperately trying not to get swept underneath, Anthony leapt from his canoe to get a rope to the trapped boater. Facing upstream, and honestly too afraid to exit my boat, I didn’t move until I heard the desperation in the cries for help behind me. Seeing that Anthony was unable to pull her out on his own I decided to exit my boat. Holding onto the ice, I pull my skirt and roll out onto the soft ice. 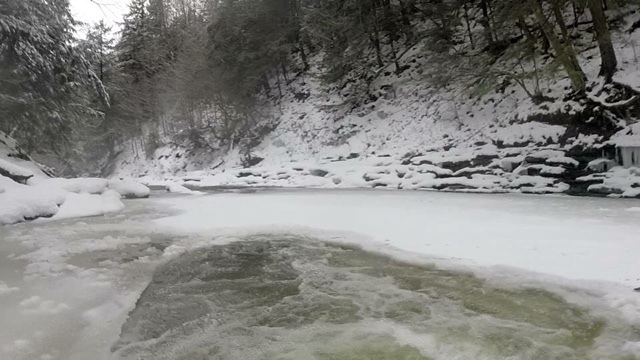 I kept rolling until the ice was solid beneath me. 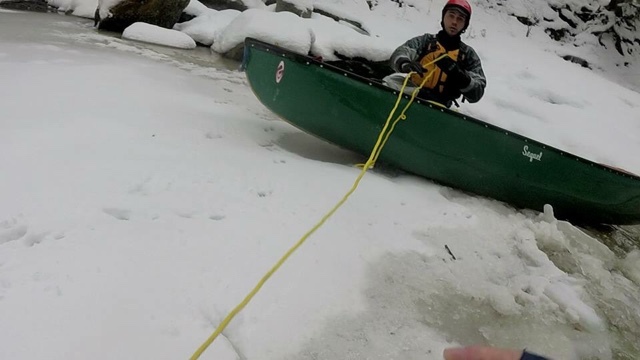 Fearing that I was going to fall through the ice, I belly crawled to my friend and eventually got a hand on the PFD and pulled Mar out and onto the ice. Thankfully everyone made it out of this situation OK. However, this exhausted our daylight and the thought of ice dams never left our mind. The remainder of the run was fortunately ice dam free, but we were now fighting fatigue, the cold, and time. As darkness set in, strainers now became a bigger concern than ever. In the dark, hand signals mean nothing. The word stop is useless. At one point, Anthony running lead gets wedged on a tree. I hear him saying to eddy out, but it’s too late for me. I was following too close so I could maintain a visual contact on him. I got lucky and was able to catch a hole in the bank right behind him which allowed me to get safely out. Laura was the third boat and was far enough back, so she was just paddling towards voices that she heard even though she could not make out what was being said. She came in hot, capsized and went under the strainer and lost her paddle. Fortunately it was clear below the tree and she passed safely underneath. And the fourth boater just squeezed by. I however found myself trapped with no way to get back in the water safely with my boat. So Anthony and I walked each other across some pretty swift moving current with the strainer about 10 feet behind. I had stayed pretty dry until then. 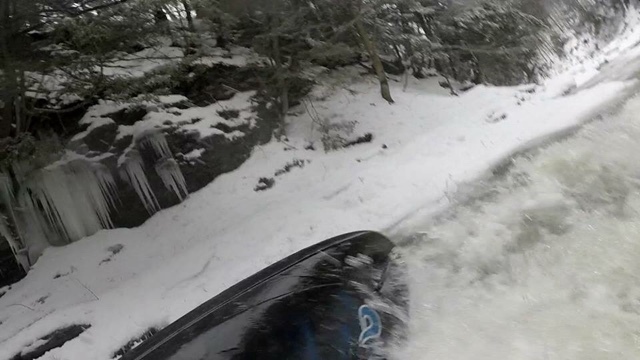 That left us very cold with the longest, darkest half mile to the take out I ever paddled. 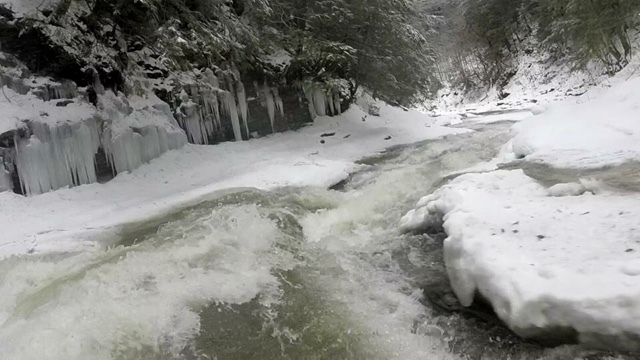 And for all that we endured, this creek was amazing. 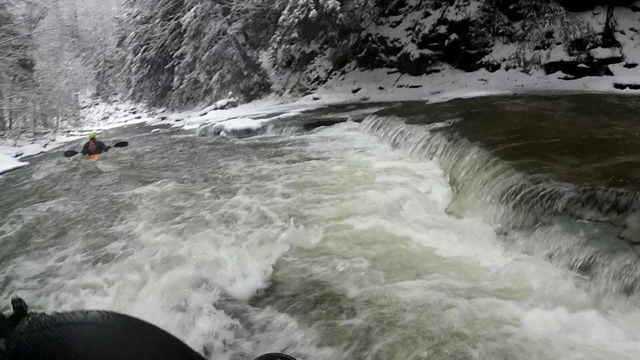 With plenty of small drops, short chutes, and non stop water, this creek is a great introduction to steep creeking. With a few more inches of water this creek would be a non stop thrill ride. 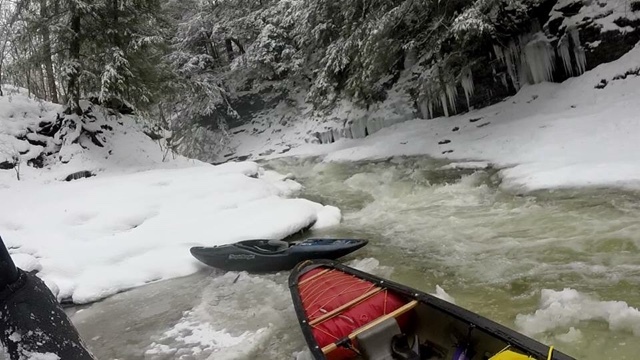 The “Chug” is a must paddle when it’s a bit warmer and there’s no ice! 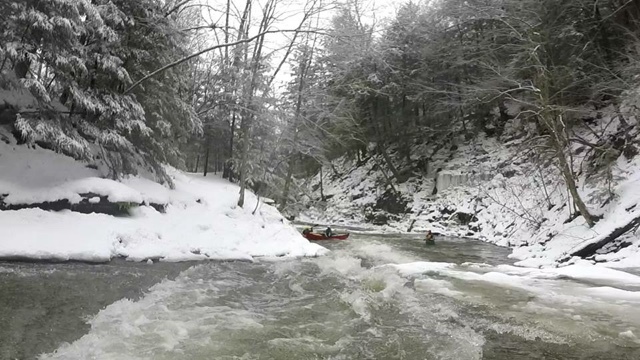 Zoar Valley Paddling Club is a whitewater kayaking and paddling non-profit organization that spans from the Buffalo Western New York to North Western Pennsylvania Regions. 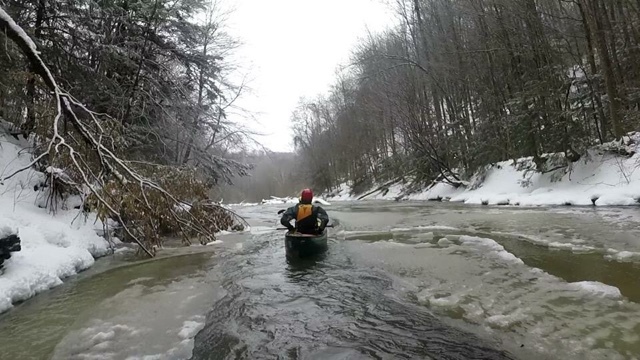 Our purpose is promoting and practicing proper paddling and safety, organizing and holding club trips and events, aiding in river protection and conservation, and introducing river sport to new members. Stay safe and we’ll see you on the river. I'd really like the author to put a little more emphasis on the lessons learned, and what SHOULD have been done. 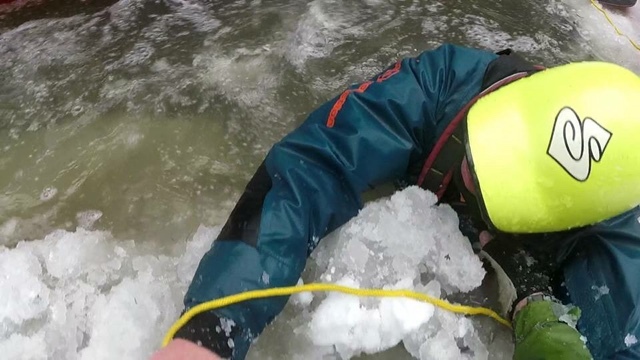 Running ANY water without scouting first is a serious breach of safety practices. Doing it in mid-winter is downright negligent. You endangered the lives of everyone in your crew, and you end your blog in an upbeat, "wow, that was fun" manner? I know the ZVPC, and you're usually a very safety-conscious group. Please take to heart all the lessons learned here. You had good gear, good clothes, and good boats. This time, it hedged your odds just enough. You were lucky everyone survived. Think on that. Let it really sink in. You were lucky no one died.